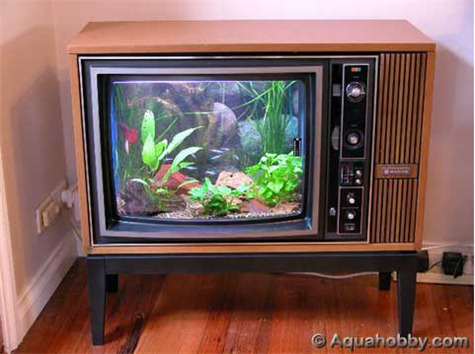 Turn your TV into a fishtank with help from Aquahobby.com, but keep your Hulu account. I think I watch too much TV. This past month, I started watching an Australian rodeo soap opera from the eighties with alarming regularity (3-4 hours a day, give or take). It has reached the point that I occasionally lapse into an Australian accent in my mind and think of the main characters as close friends. I know I should be doing something more productive, but I lack self-control when it comes to remotes. It’s cold out and I’m not the only American planted in front of the tellie for long hours, but with seven more seasons to go, I’m a little worried for my sanity. How much television is too much? Should I pull the plug? When I taught creative writing to juvenile delinquents, everyone wanted to go outside and smoke during our break. Seeing that my students ranged in age from 12-18, it was highly unlikely that I would ever let them out. Instead, we played a little breathing game. I had everyone who was aching to smoke raise their hand. “How bad do you want it?” I would ask. “So bad” they would answer. Then, we all sat and breathed for maybe three minutes. They surprisingly loved this, silent breathing. I told them to just listen to their breath, in and out, in and out. Five minutes later I asked of they still wanted to smoke and no one raised their hand. My point? Addictions seem like necessities until the moment passes and we forget what we wanted to begin with. I.e., when Mondays come I ache for The Bachelor and sit there for two whole hours numbing out to some sadistic dating nosedives. It feels like I can’t live without it, but in truth, what would I do for those two hours without the TV? You know the answer. I would read a book, write a book, make art, exercise, cry…any number of things far more productive than sitting and watching these women crush themselves for a vapid aviator. Too much TV is when a) you can’t control how much you watch b) when it is keeping you from doing the things you need to do c) it is used to avoid dealing with your own feelings. Remember, though, TV is not wholly the devil. There are merits here. It can be a source of mental relief, a source of connection (think Millionaire Matchmaker), and a source of education. But when the TV prevents you from facing your feelings or doing your work, then its time to shut that bad boy down. You know if this relationship has gone too far. Pulling the plug seems impossible, but I promise, like my teenaged badass students, you will be surprised by how little you miss your crutch when it is gone. Living without a television is empowering and permits opportunities to find deeper parts of yourself. Pull the plug! All in all a happy Hulu medium is great. Online television is the best because unlike a TV, accessing it is a bit more involved, which means you need to be more conscious about turning it on. Limit yourself to one show a day or week, if possible. Then, watching Gossip Girl or Aussie trash or Extreme Paranormal will feel like icing on your day’s cake. Some of us need TV, in moderation, to give our brains a rest from introspection. Take this TV Addiction Quiz from TrashYourTV.com: Your Complete Guide to a TV-Free Lifestyle. Also check out Kill Your Television, especially this Television Addiction Identification and Self-Help Guide. One more: The Center for Screen Time Awareness at www.TVTurnOff.org.